Son of the great Valentino Mazzola of Torino and sadly the Superga air disaster, Sandro Mazzola was a great in his own right. Part of ‘Le Grande Inter’, he had a massive impact on the golden era of Inter Milan under Helanio Herrera. Despite the defensive tactics employed by the team, Mazzola was a regular scorer from the outside right position and especially so in the European Cup. An integral part of Inter’s run of three finals in four years from 1964-67, he scored some of the most crucial goals in that time. Facing European giants Real Madrid complete with Di Stefano, Amaro, Gento and Puskas in the 1964 Final, Mazzola was the difference with two goals in a famous 3-1 win, coming after his two goals in the Semi finals put Inter through against Borussia Dortmund. A year later, it was Mazzola’s away goal in the semi final away to Liverpool that made the difference on aggregate as the Italians defended their crown. Fast forward to 1967 and Mazzola scored in the final again although this time it would end in defeat to the Lisbon Lions of Celtic. A few inches to the right and Rensenbrink would have scored the winning goal for the first time in Holland’s history and finished as the tournament’s top scorer. Instead, people talk about how they would have won it with Cruyff. Football can be a cruel game. In the words of Jan Mulder, his Holland and Anderlecht team mate “Robbie Rensenbrink was as good as Cruyff, only in his mind he was not”. The previous year also saw him score in the semi final stage against Monaco for Chelsea, whilst in 1999 he scored the opening goal in the UEFA Cup Final as a star studded Parma team demolished Marseille 3-0. And to confirm his big game credentials, 1996 saw Crespo’s brace in the second leg of the Copa Libertadores Final to win the tournament for River Plate, for only the second time in their history. Final goals in three major competitions leaves his place in the list unquestioned. Very much a Copa Libertadores specialist, Marcelo Delgado was not prolific striker (his 18 caps for Argentina produced no goals), but he was very much a man for the big occasion. Only two men in the history of football have scored more Copa Libertadores Final goals – Uruguay’s Alberto Spencer (more on him later) and Coutinho of Brazil (#42). Delgado’s first came in the 2001 Final when Boca Juniors faced Mexican side Cruz Azul. Delgado scored the away goal as the Argentines won in Mexico, only for the second leg to end in a reverse. Penalties ensued, and as befitting of a big game player, Delgado scored what would prove to be the winning penalty to give Boca their 4th title. Two seasons later he was at it again, this time scoring in the semi final win against Colombia’s America de Cali before an all Argentine team beat Santos 5-1 on aggregate. Alongside Carlos Tevez in attack, Delgado scored three final goals (two at home, one away). He then briefly left the club for a one season spell with Cruz Azul where he formed a partnerhip with Delgado (Cesar) before returning to Boca for 2005-06. In all, he won three Libertadores medals with the Buenos Aires team, who have won the trophy six times in their history. The Uruguayan and some time Italian international (that sort of thing was a lot more common back then) was part of the Maracanazo final of 1950. With Brazil leading it was Schiaffino that struck the equaliser in the high pressure Final against the hosts. Uruguay would go on to claim their third crown, much to the World’s surprise, with a goal from Ghiggia (51st on this list). For his club teams the forward excelled for Penarol in Uruguay but it was after a move to AC Milan in the mid 50′s that he’d score more high profile goals. He hit one in the 1956 European Cup semi final defeat to Real Madrid who were taking their first step to becoming the greatest team in competition’s history. Two years later he hit two more at the semi final stage to knock out a Manchester United that were tragically weakened by the Munich air disaster. In the Final Shiaffino actually put the Italians 1-0 up, but it wasn’t to be as the game ended 2-2 after 90 minutes and 3-2 to Madrid after extra time, thanks to Gento. Ronaldo has an unfair reputation of being something of a flat track bully. But fear not Cristiano, you’ve made it into the Top 50 big game scorers, which is one of, if not the biggest achievement in football. He’s specialised in the Champions League with a semi final goal against AC Milan in 2007, followed by a brace at the same stage in 2009 against Arsenal, and then another two in this year’s semi final against Bayern, this time for Real. The biggest goal came in the 2008 final against Chelsea as United completed a memorable double when Ronaldo scored one of his famous headers. A year later, he didn’t score in the Final, but was Man Utd’s best player and the only one that put any real pressure on the Barca goal. For his country, a semi final strike for Portugal on home soil in Euro 2004 is the biggest goal he scored as they qualified for the Final, and if you point to the winning goal in the Copa del Rey Final (2011) against Barcelona and an FA Cup final goal against Millwall, then you have a case for the defence. In short, he’s not a bottler. Despite spending a large chunk of his career in Spain with European regulars Barcelona and Villarreal, all of Riquelme’s big game goals have come in South American games, for club and country. 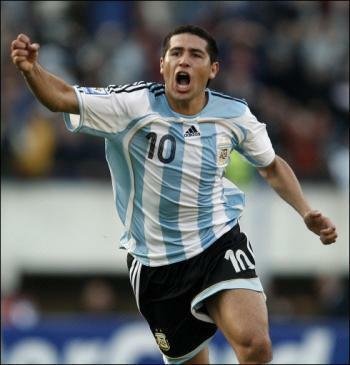 A gifted if slightly lazy number 10, Riquelme specialised in dictating play and set pieces. A legend at Boca Juniors where he’s sometimes been seen as a disruptive influence (it is rumoured that team mate Martin Palermo retired instead of playing another season with him), the talented number 10 and Scarface impersonator brought back the good times to Boca. Scoring in the semis on the way to Boca’s first title in years (alongside Delgado), he would go on to do so again on his return to Argentinean football with semi final goals in both 2007 and 2008. But it was for his contribution to the 2007 final that would result in a statue being erected in his honour. Facing Brazil’s Gremio, Boca won the first leg 3-0 with Riquelme scoring the second. In the second leg, the playmaker scored both goals to give Boca a 5-0 win. Impressive. For his country, he often played second fiddle to Veron and Aimar but was on target in the Copa America semi final of 2007 against Mexico on the way to defeat in the final against Brazil. Another of the great Real Madrid side of the 1950′s, Rial joined Real from fresh from winning the Uruguayan championship with Nacional. Born and bred in Argentina (although he played for Spain), the front man spent seven seasons in the Spanish capital from 1954 to 1961 – neatly coinciding with the five straight European Cup wins. And he had a pretty big part to play in them too. In the Semi Final of the first ever European Cup in 1956, Rial scored the first goal as Madrid knocked out Milan 5-4 on aggregate, and in the final, would score both an equaliser and the winning goal as they defeated Stade Reims 4-3. Not content with being the man to make the difference in the biggest club game ever played, he scored two semi final goals the following year – this time home and away against Matt Busby’s Manchester United before Real would claim the trophy against Fiorentina. In the 1957-58 competition he scored a 79th minute equaliser as Real came from behind to beat AC Milan to win their third successive trophy. He was scoring not only in the big games, but decisive goals. By the time the 1958-59 season had come around, the tournament had grown from 16 teams to 28, not that it made any difference to Rial and Madrid. He scored the equaliser in the semi final stage against city rivals Atleti before claiming another winners medal in the final. Sure, his international career wasn’t much to write home about (5 caps and 1 goal for Spain), but when it came to performing in the big matches, Rial was a man to rely on. There’s always been a feeling of Del Piero going missing in the big games (regular readers may remember these stats), but that’s only when taking his ability into account. The fact that he’s still 22nd on the all time list of Big Game Scorers suggests that maybe he has been a man for the big occasion. Hi first big game goal came in the 1997 Champions League Final against Borussia Dortmund as Juventus lost their crown as the Champions of Europe. Fast forward to the 1997-98 competition, and Del Piero was top scorer with 10 goals. In particualr, he absolutely dominated the semi final stage – hitting a hat trick in the first leg at home to Monaco, before soring his fourth against them in the return leg. Unfortunately for him and Juve, despite reaching their third successive final, they’d lose 1-0 to Real Madrid and a goal from Pedrag Mijatovic. He wasn’t quite done there though, as he scored in the semi final of the 2002-2003 tournament, getting revenge on Real as they were defeated 4-3 on aggregate. In the final, despite scoring his penalty in the shoot out with AC Milan, he ended up with his third runners up medal in seven years. Even more disappointing is that Juve had finished a massive 16 points ahead of their conquerors in Serie A. For the natioanl team, Del Piero famously missed two good opportunities as France came from behind to win Euro 2000 in extra time, but he would have redemption in the shape of World Cup semi final goal against hosts Germany in 2006. World Player of the Year? Check. World Cup Golden Boot? Check. Scorer of 1000 goals? Check. All things point to a natural inclusion for Romario on this list. His most important goal came in the 1994 World Cup semi final win against Sweden to Brazil in their first final for 24 years. He also scored his penalty in the World Cup Final shoot out better known for Baggio’s miss. Aside from 1994, Romario also popped up with some valuable goals on the way to winning the Copa America in 1989 and again in 1997. The 1989 edition saw final group stage goals against bitter rivals Argentina, Paraguay and then in the final group game to decide the winners against Uruguay. Eight years later and with the tournament back in a knock out format, Romario scored a double in the semi final as Brazil scraped past Peru 7-0 on the way to winning the tournament. Big game scorer then? Well maybe, but if you’ve claimed to have scored 1000 goals (including youth matches and presumably headers and volleys in the back garden), surely you should have scored more than six goals in the Finals and Semi Finals of major tournaments? Especially when playing for the likes of Brazil and Barcelona. In fact, when you scrapte the surface, he played in the Finals of the 1994 World Cup, the 1994 Champions League, and the 1997 Copa America, but didn’t score. Fair enough, you can’t be expected to score in every match, but when you say that you’re better than Messi, and equal to Pele, Maradona and Zidane, then you should probably be able to back it up a bit better. More on Messi vs Romario (and Ronaldo, Rivaldo and Ronaldinho) here. You forgot some Romario´s goals in the European cup/UCL finals. He scored 20 goals in 31 games in the UCL and produced some great moments, like a hattrick against Steaua Bucarest, 2 goals in the semi against Real (88/89). From 88 until 95, he was a joy to watch in Europe. After that, he came back to Brazil and I only saw him in the National team.